I can just hear some people out there saying “Why would I spend five bucks on this tiny candy bar when I could get a big bag of Whoppers for half the price?” This is a valid feeling, and we here at Candy Addict do try to eschew snobbery whenever possible. But if you’re the kind of person who turns up their nose at expensive candy, just go ahead and stop reading, because this review isn’t for you. Still there? Good, because I have a marvelous discovery for all the die-hard Candy Addicts out there who simply need to know the best of what’s out there. BonBonBar Confections is a name you need to remember! 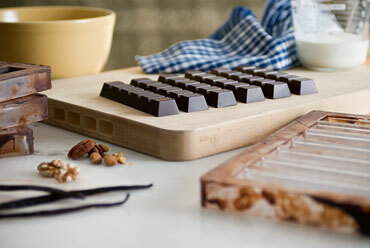 This Los Angeles-based company specializes in luxury chocolate bars and hand-made marshmallows. They use a lot of locally-sourced, organic ingredients; corn syrup and artificial yucky stuff are not allowed. The packaging is humble, simple lettering on white labels, but trust me, the packaging isn’t the star of the show. 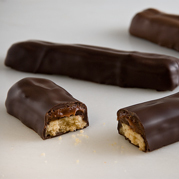 The Malt Bar is basically a stick of shortbread with a layer of malty ganache, enrobed in chocolate. I love the flavor of malt, but I’m not really a big fan of most commercial chocolate-malt balls. This makes the BonBonBar Malt Bar particularly delightful, because it’s everything familiar to me – crunch, chocolate, and malt; but the quality is multiplied by a gazillion. The aroma and flavor are malty, but not overpoweringly so. The creamy ganache complements the slightly salty cookie perfectly, and the chocolate outside is creamy and fragrant. 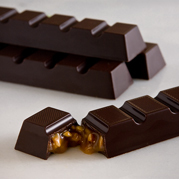 This is another bar that updates a classic – this time, we’re taking on the Caramello and Snickers. It’s a hard, dark chocolate shell with gooey caramel inside. Again, I love the chocolate, and the caramel is salty, creamy, and complex. The caramel taste is simply amazing. There’s a pleasurable crunch from cocoa nibs and fresh mixed nuts. My only complaint about this bar is that I can’t buy it at every gas station and movie theater. These come in two flavors, Vanilla and Passion Fruit, and both left me speechless. They were soft, light, airy, and just slightly chewy. The square shape is a telltale sign of hand-craftsmanship. Both flavors are amazingly true-to-life; the Passion Fruit is tangy and tropical; equally exotic, the Vanilla smells luxuriously like the two types of vanilla beans from which they’re made. 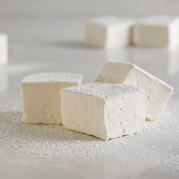 I’ve been meaning to try my own hand at making marshmallows at home, but now I think it would be a better use of my time to just track down a shop that sells these. BonBonBar Confections may come disguised as plain marshmallows and candy bars, but don’t mistake these for anything other than gourmet treats – all of the luxury, with none of the pretension. I’ll admit, my first thought when I saw the $19 Sampler was “That’s it?” (The box is about the same size as the box of checks you get when you open a bank account.) But I quickly forgot about the plain wrapping and diminutive size the minute I took my first bite. BonBonBar only sells these three products right now, but they’ve developed others. In fact their website right now says “Coming Soon for Valentine’s Day: Scotch Diamonds made with Single Malt Scotch and Salted Caramel!” I’ll be anxiously awaiting the day I can try their latest and greatest. Till then, I will definitely buy another sampler, and marvel at how something so delicious can be entirely familiar, yet entirely unique, all at the same time. I ‘d like to have some me too. Your review has convinced me…I need to taste these! I noticed these a while back. The flavors sounded great, but the price seemed a little steep. It’s good to know that they are worth it! Oh my god, these look SO good! And your descriptions have made me offically salivate. Excellent. What’s not excellent is how hard it’s gonna be to find and afford these on my measly budget! But if I do find ‘em, I’ll have to splurge on at least one thing…but which one shall it be? Dang. This is Brian, owner of Candy Addict – let me just add… I got samples of these too and they truly are fantastic! The candy bars in particular were WONDERFUL! Wow, how do you make something sound so damn good? Do you know a store where you can find these and are a reasonable price? If so please speak up!!! I just ordered the sampler box, they look really good!